We trust you all had a good Christmas and were able to receive and give many blessings during this time. 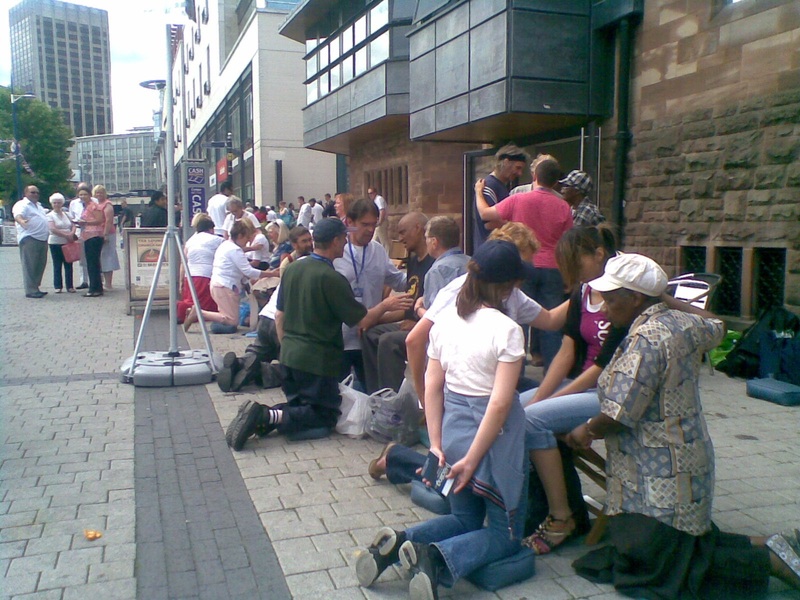 The passage from Isaiah 2 was very much part of our encouragement as we went out on Edgbaston Street in December. As it was expected the town was crowded with people and there were activities of all kinds to mark the Christmas festivities. We were one of them. However, the verse we had on that day from Isaiah affirmed us we stand in a different position from all others: ‘In the last days the mountain of the Lord’s Temple will be established as chief among the mountains; it will be raised above the hills and all nations will stream to it… ‘Come let us go up to the mountain of the Lord……He will teach us his ways so that we may walk in his paths’ ( Isaiah 2:2-3) The Land on Edgbaston Street were occupied by many and yet we had the sense that we owned the land. We thank God that he establishes his presence amongst his people. 1. A lady had a slipped disc. The team prayed for her. She felt something shifting in her back but wasn’t so sure what was happening. She couldn’t say if any healing had taken place. Who knows she may come back to tell us more. 2. A whole family came for prayer – for physical, emotional and spiritual needs. 3. A man with very painful knee – due to previous dislocations – experienced considerable reduction of pain after prayer. 4. A man with an unforgiving heart – left with a forgiving spirit and saying he experienced warmth and acceptance. 5. A mother whose son was just out of the army – her son is suffering with post traumatic stress disorder and blames her. Please pray for this mother and son. There are many suffering because of wars. Please pray for many others who are suffering because of persecution and oppressive regimes. May they find the Mountain of the Lord established here with us. May they find us to be he hosts of God’s Spirit so that God’s presence will be raised above the hills and all nations will stream to it.